Dr. Dan McRackan has been in private practice in Raleigh since 2009. 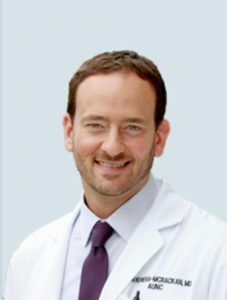 He completed his Urology residency at the University of North Carolina at Chapel Hill and prior to that his Doctor of Medicine at the Medical University of South Carolina in Charleston, SC. Learn more about him by reading the spotlight below! What to read his complete bio? You can find it here. 1. How did you decide on your particular specialty? Why urology? As urologists we have the fairly unique opportunity to cure different diseases quickly and effectively. We also handle a variety of different topics including prostate cancer, kidney cancer, urinary problems, and kidney stone disease. 2. What is your favorite part about being a physician? My favorite part of being a physician is seeing people through a very difficult time in their life. I get to know patients and their families very well and I see them for years after their surgeries or procedures. Often we get to reminisce about the terrible year when they were diagnosed with their cancer and share in the relief of that time having passed. 3. When did you first learn about HIFU as a treatment for prostate cancer? 4. What do you typically tell a patient when they are first diagnosed with prostate cancer? When a patient is first diagnosed with prostate cancer, I usually tell them to just take a deep breath and don’t make any immediate decisions. I tell them it can take weeks and sometimes months to decide on the right treatment. Very often we have diagnosed the cancer long before it has spread and so we have time to work together as a team. 5. What different types of treatments do you offer men with localized prostate cancer? In general, there are three “traditional” options for localized prostate cancer. The first is surgery which is really the “gold standard” and has been around for decades. Unfortunately, there can be significant sexual and urinary side effects associated with surgery. The same is true for different types of radiation therapy, such as external beam or radioactive seeds. That is why HIFU is a great option in specific circumstances, it has a lower risk of side effects and, for the right patients, can be just as effective as those “gold standard” treatments. 6. In your professional opinion, what are the benefits of HIFU as a treatment for prostate cancer? The benefits of HIFU are quite clear when it comes to side effects. HIFU is extremely well tolerated and compared to other treatments has very minimal side effects. For a patient to qualify, the cancer would have to be a low or moderate risk tumor that is completely localized to the prostate. Often we can treat only the part of the prostate that is cancerous and spare the rest. In that case the side effects are even less. 7. When you aren’t practicing medicine what do you like to do? When I’m not working I like to spend time with my family and I love to travel with my wife and two children. If you have any additional questions about prostate cancer, prostate cancer treatment, or HIFU for prostate cancer, please contact us for detailed information and treatment locations. We are proud to partner with so many amazing doctors who care as much as we do about preserving the quality of life for your patients.